The Star of Bethlehem has become a symbol of Christmas. During the holiday season, a star-like object is traditionally placed upon Christmas trees or positioned above the baby Jesus in manger scenes. This star was a light that informed the magi about the birth of the Messiah. Many Christians also believe that "the men from the east" followed the star from distant countries (possibly Persia, Babylonia or Saba and Sheba) to the exact place where Jesus was located in Bethlehem. Many astronomers and researchers have attempted to provide a naturalistic explanation for the Christmas Star. Some say that the star was a convergence of astronomical bodies, or a supernova. An alternative to this kind of naturalistic explanation is to believe that God caused something supernatural to happen. Those who believe that there is a "natural" explanation for the star often think that God's prior planning and wisdom are evident in various events that could have been interpreted as celestial signs concerning the Messiah. In that sense they do not deny the supernatural, but rather insisted that various celestial events involving the star had been planned since creation itself. Matthew 2:9 states "After they had heard the king, they went on their way, and the star they had seen in the east went ahead of them until it stopped over the place where the child was." The Scripture makes clear, that star "went ahead of them," implying motion, and a continuing action in leading them. To actively lead them, the star had to change direction as they moved on the ground, as they followed the road over the hills of Judea toward Bethlehem. The star had to always direct them towards Bethlehem. No astronomical object or grouping of planets could go before them, pointing the way, as the Scripture describes. Astronomical objects can not change direction reacting to our motion on the ground. Astronomical objects follow the same path as the stars, rising in the east and setting in the west, as the Earth turns. (Planets move only slowly against the background of stars, the name planet meaning "wanderer"). Astronomical objects don't point in the same direction for many hours or days at a time, they rise, come to maximum altitude, and then they set. The only astronomical object that can stay fixed on the sky is the north star, Polaris. But Bethlehem is not to the north as you leave Jerusalem, and the wise men were clearly not so foolish as to follow the north star. Since the Scriptures tell us that the star "went ahead of them, till it came and stood over where the young child was," and no astronomical object could have gone before them as the Scripture says; we are therefore forced to either accept the supernatural, or to discount or modify the Scriptures to obtain agreement with a naturalistic model. We know from Matthew 2:3-4 that Herod gathered the chief priests and the scribes of Jerusalem, the wisest men of his kingdom, and inquired of them regarding the star; and that Herod and all of Jerusalem was disturbed (verse 3). So the wise men of Jerusalem were watching. If the Christmas Star had been seen by the priests, by the scribes, or by the servants of Herod, then they also would have followed the Star to Bethlehem; and they would have brought the child back to Jerusalem, or killed Him if they could. But the Star was not seen by the servants of Herod, so they couldn't follow what they didn't see. This shows us that the wise men from the East, who were believers and worshipers of the one true God, who waited for the true King of Israel, they saw the Star. But the wicked and unbelieving servants of Herod, who were also looking, couldn't see His star. This clearly illustrates the supernatural essence of the Christmas Star. Suddenly there was a change in the star's motion. Again in verse 9 we read that, the star "stood over where the young child was." The description is of a clear change, from leading and going before them, to lead the way; to standing still, and by standing affirming that they had found the child, which they had traveled so far to see. An astronomical object can't point to a particular place on Earth. To see this, consider the Moon. As seen from opposite sides of the Earth, the Moon shifts against the background of distant stars by less than two degrees, about one finger at arms length. You can verify this by watching the Moon as you travel on a long straight road. The Moon will remain in the same direction, except for its slow motion across the sky with the stars. Since the Moon is our closest neighbor in space, it is clear that no object at the distance of the Moon or beyond could point the wise men to a particular house within the village of Bethlehem. To point to a particular house within the village, by standing over the house as the Scripture says, the star when seen from different locations inside the village would have to change position against the background of stars. For this to happen the Christmas star had to be within the Earth's atmosphere and close to the ground, perhaps only a few hundred meters up. This requires a genuine miracle, like the pillar of fire and of smoke which led the Israelites in the wilderness for forty years. The Scriptures tell us that the pillar of fire and smoke was the glory of God, clothed in cloud to protect the children of Israel. So should we be surprised to find the glory of God leading the wise men to the savior of the world, Jesus the Christ. There is always the possibility that the star was indeed like the pillar pointing at the house, or that the star shown a light on the ground, illuminating the house. Even if such were the case the "star" was likely within the Earth's atmosphere. All these clearly show the supernatural nature of the Christmas Star. There is simply no astronomical explanation that fits. The conjunction in the southern sky of Jerusalem (7BC). 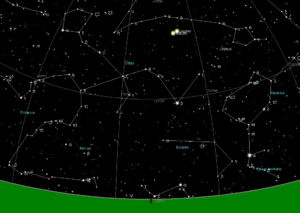 View animated sequence of 7BC conjunction. Several events have been proposed as leading the Magi to believe the King of Kings was to be born in Judea. The events suggested are mainly conjunctions of planets or conjunction of planets with stars. A supernova and comets have been suggested too. It has been argued that a supernova cannot lead and the stop, since it is fix in the sky. Comets are moving, but the general idea in ancient times was that comets were bad omens. Due to these arguments the most popular natural explanations focus on conjunctions involving a planet, since planets move and appear to stop. In ancient times, planets were seen as moving stars, so the word star could be used for a planet too. Normally a planet goes from east to west in the night sky, since all planets circle the sun in the same direction. However, the earth circles the sun too, and does so faster than the outer planets, Mars, Jupiter and Saturn. Due to this, it will sometimes appear as if the outer planets are slowing down, stop and change direction. The stop is called a 'stationary point' and the normal, forward direction is called prograde motion while the opposite is called retrograde motion. The stop is best compared with how cars are view against the background as we overtake them. At first they appear to have a good speed in relation to the background. When we approach them, they appear to slow down, and when we overtake them they appear to go back, seen in relation to the background. In the case of the outer planets, they will be in prograde motion, reach a stationary point as earth catches up with them, then enter retrograde motion, but after some months, the planets will go to a new stationary point and start a prograde motion again. Some of the proposed natural explanations to the Star of Bethlehem ignores what the Bible says about the star stopping. Other theories ignore what the Bible says about the star leading the magi from Jerusalem to Bethlehem. 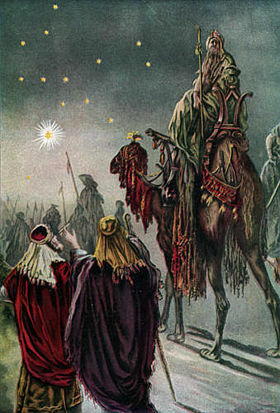 A popular miscomprehension is that the star went before the magi from their native country to Jerusalem, but that is not what the Bible says. The Bible only say that the magi saw the star, went to Jerusalem and then saw the star leading them. In 7 BC Jupiter and Saturn came close. They do so regularly with an interval of roughly 19 years. These conjunctions has a meaning in Zoroastrianism as well as in Babylonian divination. In Zoroastrianism, the astronomers noticed that Jupiter and Saturn reach conjunctions in only three constellations for about two hundred years. Then they switch to another set of three constellations for two hundred years, and so on for about 800 years, when they return to the first set of conjunctions. The return after 800 years to the first three constellations (Lion, Archer or Centaur) is called the great conjunction, and it only happens once in 800 years. In reality the switch between one set of three constellations to a new set is not instant. The planets could temporarily go back to the previous set, but the great conjunction happens only once in 800 years, and concerns the first return to the first set of constellations. According to Zoroastrianism, the great conjunction is the omen of the birth of a great Savior, and thus it has been argued that the Star of Bethlehem was a great conjunction. Devastating to this theory is that the theory about the great conjunction was developed by Muslim astronomers, i.e. long after the birth of Christ. The Zoroastrian religious text are mostly from the middle ages, and a sound explanation is that the Zoroastrian religion has been influenced by Christianity and not the other way around. Even more damaging is the fact that the great conjunction happened in 26 BC, far too early. In medieval times, the theory about the star being a conjunction between Jupiter and Saturn became popular, but the astronomers realized that the 26 BC conjunction was too early, so the 7 BC conjunction was proposed instead. It happened in the constellation Pisces. Thus the medieval astronomers invented the idea that Pisces was related to the Jews, which it was not in the time when Christ was born. In Babylonia, the magi used the divination manual Enuma Anu Enlil. According to the manual, the conjunction of Jupiter and Saturn means that the heir apparent will rise to the throne within two years. The present king could see this positively, if he was old, or try to postpone this by sacrificing to the gods. Since Enuma Anu Enlil is concerned with internal affairs in Mesopotamia, which then was a part of the Parthian empire, the natural interpretation would be that the Parthian king would be succeeded by his heir. However, some have argued that since the conjunction also involved Mars, and since Mars was connected with the Jews, the magi would have seen it as a sign of a birth of a Jewish king. Archaeologist and Assyriologist Simo Parpola has suggested this explanation. However, the connection between Mars and the Jews is not an established connection. Jews are not mentioned in Enuma Anu Enlil, and the connection between nations and stars, constellations and planets was a Greco-Roman idea developed during the first centuries after the birth of Christ. Even if the 7 BC conjunction is believed to have guided the magi to Jerusalem, it can in no way explain how the conjunction guided them to Bethlehem. In the middle of September 3 BC, Jupiter passed above the star Regulus (translated Little King), in the breast of the constellation Lion. Rick Larson and others have interpreted this as a sign that the King Star is crowning Regulus, the little king. Since it happened in the Lion and since the Jewish king could be called the Lion of Judah this is seen as a sign about a new king being born in Israel. However, the interpretation of this sign, according to Enuma Anu Enlil, is that the king of Akkad will die and someone else will take his place. Akkad was an ancient name used especially for much of central and southern Mesopotamia (more or less equivalent to Babylonia). According to ancient Christian tradition, the Star of Bethlehem was a new star. It has been suggested that when Jupiter and Venus rose the 17th of June 2 BC, they were seen as a new star. Since Jupiter is well known to be the King Star and representing kingship while Venus is the fertility star, the conclusion is that the two of them together was seen as an omen about the birth of a king. Since the sign appeared in the west, seen from Babylonia, it has been argued that this sign guided them to Israel. This interpretation has been done by many, for instance Rick Larson. The interpretation according to the Babylonian divination manual is quite different: "If Venus reaches Sulpae [Jupiter] and they follow upon each other: high water will carry off the land. If Venus reaches ditto and passes it: a mighty high water will come. If Venus and ditto come close: reign of destruction (concerning) the king of Amurru. If Venus comes near ditto: the land altogether – brother will become hostile to his brother. If Venus enters Jupiter (UD.AL.Tar): the king of Akkad [i.e. Mesopotamia] will die, the dynasty will change, either a soldier will go out or the enemy will send a message (asking for peace) to the land." Rick Larson, is an American Lawyer. He has produced a video called The Star of Bethlehem Documentary. He proposes that the magi saw the conjunction of Jupiter and Regulus and then nine months later the conjunction between Jupiter and Venus. His interpretation is that these two signs told the magi that a king would be born and was born in the west. They traveled to Jerusalem, and when they were directed to Bethlehem, they saw Jupiter in front of them, since Jupiter was to the south of Jerusalem in December 2 BC. Larson suggests that they arrived in Bethlehem the 25th of December, when Jupiter entered into a stationary point, and thus stood still. The American astronomer, Aaron Adair has argued that this is not plausible, since no one can see when Jupiter enters into a stationary point. It is a too slow event to be seen by the naked eye. Larson further suggests that the two conjunctions are described in Revelation 12, since at the day when Jupiter is closest to Regulus, the constellation Virgin is clothed by the sun and has the new moon under her feet, just as in Revelation 12. That the woman is clothed by the sun is an astrological term for the fact that the sun was rising in the constellation Virgin at that time of the year. Larson assumes that the event in the summer is the event when the dragon starts to fight the archangel Michael. However, he cannot explain the snake or the other parts of Revelation 12. His arguments rests on the fact that what is seen in September 3 BC resembles the description of the woman in Revelation 12. He argues that her crown of twelve stars are the nine stars of the Lion plus the three planets Jupiter, Venus and Mars, who will arrive to the summer of 2 BC. Dag Kihlman has written The Star of Bethlehem and Babylonian Astrology - Astronomy and Revelation 12 Reveal what the Magi Saw. In the book he examines how the magi of Babylon worked and how they interpreted the skies. He criticizes Larson for interpreting the sky in a modern way influenced by Greco-Roman thinking instead of looking at how the Babylonian magi would look at the events using Enuma Anu Enlil. His result is that both events are interpreted as if the present king of Mesopotamia will die and be replaced. The interpretations of Venus approaching Jupiter are several, as quoted above. In accordance with Revelation 12, there will be a flood. But the main event is that Akkad, i.e. Mesopotamia and in reality the Parthian king, will be attacked by the King of Amurru, who will finally defeat the Parthian king. Since the Amurru area in the divination manual is the same as the Amorite area, Syria down to Israel and Jordan, and since the House of Herod at that time was the main force of the Amurru area, Kihlman argues that the magi would see it natural to expect the future king to be a Jewish prince. Further, Kihlman argues that the woman in Revelation 12, represents the goddess of heaven, being represented by Venus and the Virgin. At the day when Jupiter is above Regulus, Venus is standing high above the sun, and soon to be dimmed out of the sun coming from her right. According to the divination manual, this is an omen for difficult births, just as the woman in Revelation is screaming in pain of childbirth. Kihlman argues that the serpent in revelation 12 is the constellation Hydra, and the reason why the snake is red and crowned is because Mercury is above it. When Mercury is above Venus, she is said to be red and crowned. Mercury is the representative of the Babylonian god Nabu, which is pictured as an angel. Nabu was at the time the main Babylonian war god, and Mercury above the Snake could be seen as a representation of an old Babylonian myth where the god slew the seven headed snake/dragon. During the summer of 2 BC, the Hydra sinks below the horizon in the east, just as the snake in Revelation 12 sinks to the earth. The woman in Revelation 12 hides for 1260 days. According to Kihlman, this was a calculation made by the magi. The events in June 2 BC told about a war with Amurru. But Venus can tell when Amurru will reach peace, and Venus does this by entering her secret place in a certain fashion. Kihlman argues that this happened in the autumn three years later, and that Venus stopped in her secret place approximately 1255 days after the signal of war, and then started to leave a couple of days later. According to Kihlman, these signs were the reason why the magi went to Jerusalem. The Parthian king was not beneficial to the Babylonian culture, and the omen about a king coming from a small kingdom to defeat a king residing in Persia, resembled how Alexander the Great came from a small kingdom, defeated the Persian king and planned to make Babylon the capital of his empire. Kihlman argues that the magi went to Jerusalem to see the new Alexander the Great. The omen concerning Venus approaching Jupiter also suggests that a messenger shall be sent to seek peace. See above! Kihlman agrees with Larson, that Jupiter is the King Star leading the magi to Bethlehem. But he also agrees with Adair that the star can not be seen going until it stops on the same day. Kihlman has another explanation. The magi must have traveled very early in the morning, when Jupiter is to the south of Jerusalem. The trip is about 6 miles or 8 kilometers. The ancient road was called Derech Beit Lehem, and follows closely to the current Hebron road. The roads start south but bends gently more and more to the west as it approaches Bethlehem. Since the earth rotates to the east and since the natural road is a gentle curve to the west, Kihlman argues that anyone can follow a star to Bethlehem, if he or she stays on the road and has the appropriate speed. This speed happens to be the speed of a horse walking in its natural walking speed, called four beat gait. Anyone traveling along Derech Beit Lehem at this speed will have the same stars in front of him all the way to Bethlehem. If the magi used a horse or an other animal walking in the appropriate speed, the animal would see the road when the magi were looking at the stars, and they would see that they were constantly walking toward Jupiter. When they arrived, Kihlman argues that they found that Jupiter had stopped. The magi made diaries of events in the sky, and one of the major tasks was to record the day when a planet reached its stationary point. Kihlman agrees with Adair that the stop can not be seen with a naked eye, but since the magi recorded such events regularly they must have has a method as to decide when a planet had stopped. Kihlman points out that most of the omens in Enuma Anu Enlil are bad, and they concern Mesopotamia, wars, harvests, diseases and similar events. If the magi saw Jupiter standing in the morning, it was an omen to, and the probability for a bad omen or an irrelevant omen is very high. But Jupiter standing in the morning actually means "Kings will be reconciled", which is the same as peace on earth, an omen very fitting to the story. According to Kihlman, the author of Revelation 12 has transformed the magi's interpretation into a Christian interpretation, where the stars and planets have been hidden in order to exclude any direct connection to Astrology and Babylonian religion. While covering some similar events, the royal signs theory is an entirely different approach to the celestial events in 3 and 2 BC than those proposed by Ernest L. Martin, Fredrick Larson and Dag Kihlman. Mr. Hutchison points out possible Jewish and Babylonian aspects of the Star of Bethlehem account. ↑ Adair, Aaron 2013. The Star of Bethlehem : A Skeptical View, p. 62f. ↑ Adair, Aaron 2013. The Star of Bethlehem : A Skeptical view, p. 64f. ↑ Larson, Rick "The Star of Bethlehem." Accessed April 19, 2017. ↑ Kihlman, dag "The Star of Bethlehem and Babylonian Astrology." Accessed April 19, 2017. ↑ Reiner, Erica and Pingree, David 20005. Babylonian Planetary Omens Part Three, p. 45. ↑ Adair, Aaron 2013. The Star of Bethlehem : A Skeptical View, p. 55-57f. ↑ Colin Humphreys, 'The Star of Bethlehem', in Science and Christian Belief 5 (1995), 83–101; Jenkins, R.M. (June 2004). "The Star of Bethlehem and the Comet of AD 66" (PDF). Journal of the British Astronomy Association (114). pp. 336–43. Retrieved 2016-12-23. ↑ Colin R. Nicholl. 2015. The Great Christ Comet: Revealing the True Star of Bethlehem. Crossway; Interview Greg Cootsona. "What Kind of Astronomical Marvel was the Star of ... - Christianity Today". ChristianityToday.com; Guillermo Gonzalez. "The Great Christ Comet: Revealing the True Star of Bethlehem". TGC - The Gospel Coalition. Science tests theories on the Star of Bethlehem Frank D. Roylance. December 25, 2007. This page was last modified on 19 September 2017, at 14:57.